It has been a long, painful month for us. We were bed-ridden for two and a half weeks, fighting against Dengue, and then an overwhelming burden of office work kept us gasping for breath in the next few days. 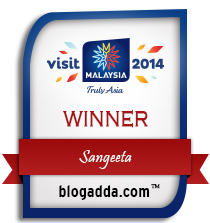 Finally, I could not take it any more as I read and languished over amazing shots of birds, wildlife and nature. It seemed as if it was the season of revelry and we were left out of it. We were out of home and on the NICE Ring Road by 6.30 am. 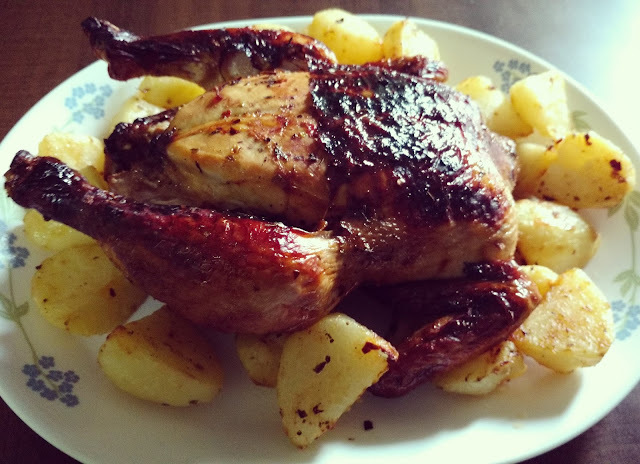 This time, there were only 3 of us – the husband, the son and I. My parents had come down to look after us and we left them along with the in-laws at home to catch up on their stories of yore. I felt awfully happy and revived out on the road and felt all my energy flowing back into me. Now I understand why doctor advise change of ‘hawa-paani’! 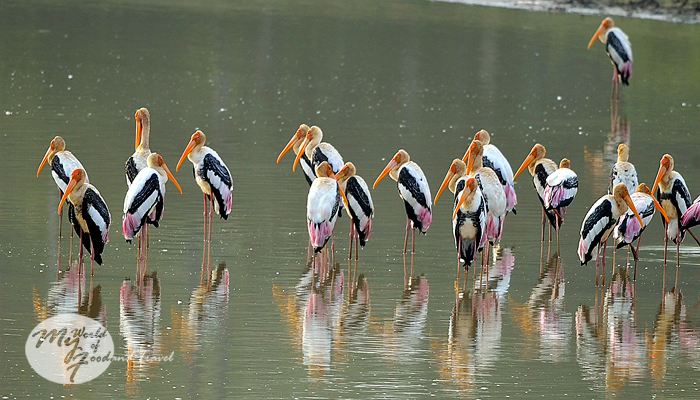 Our first birding break came when we spotted a group of painted storks and spot-billed pelicans at a water body just before reaching Harohalli. Dawn was just peeping through and the early guests were busy foraging the lake for their breakfast and enjoying a morning swim. 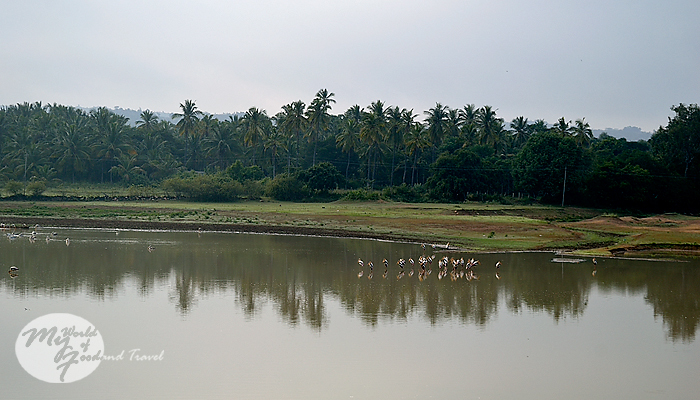 We were expecting a lot from the Kanakapura lake after our previous visit and sped towards it. To our surprise, the marshy area had dried up quite a bit and there were just the jacanas, moorhens, waterhens and purple herons. No sign of the painted snipe couple, whistling ducks and spot-billed ducks. A tad disappointed, we moved on towards our destination. We decided to have an early breakfast as well and stopped by a small pool of water after taking the left turn at Sathanur. The family of baya weavers was still there. 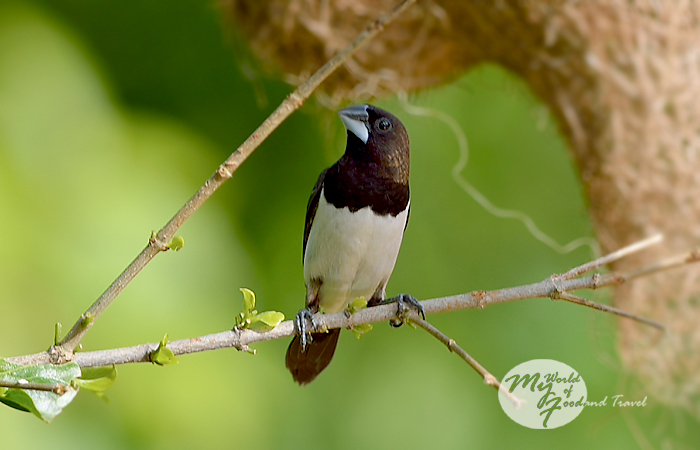 But it seemed as if their nests were being invaded by white-rumped munias. 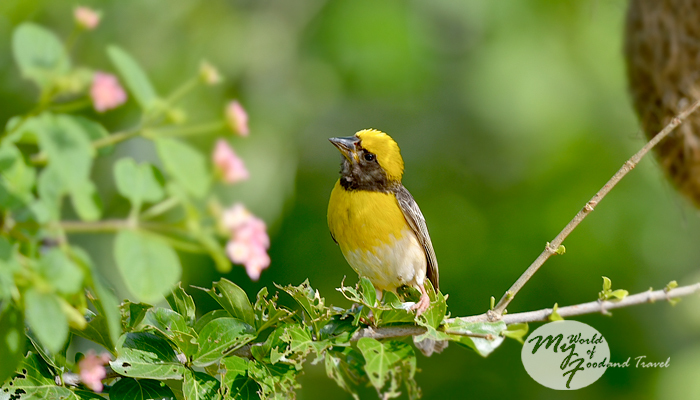 A few munias were flitting in and out of the baya weavers’ nests. Perhaps, some of the nests had been vacated by the baya weavers. Finally, we reached the gates of the jungle at around 8.30 am and had our breakfast there. 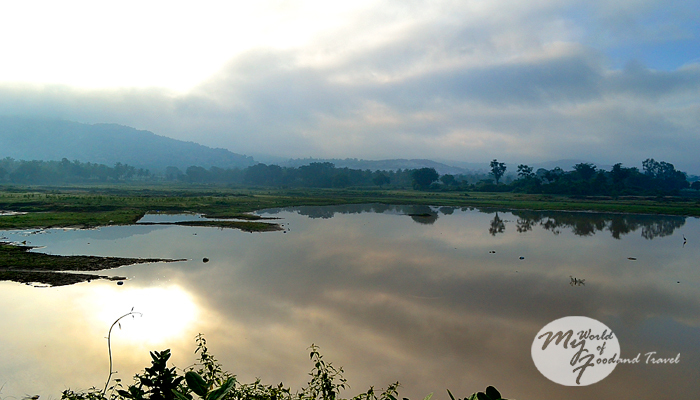 Soon, we reached the area where we had seen the crested hawk eagle and tawny eagle the last time. We slowed down in anticipation but the tree tops were bare – not a single raptor was to be seen. We looked up and saw a raptor circling about very far away. The only thing we could discern was that it had dark brown feathers, almost black, with yellow beak and yellow legs. Could it have been a tawny eagle in dark morph? But the ones we had seen last time in May were light. Or was it a black eagle? How I wish someone could help us in identifying that raptor. Just as we were deliberating on its identity, a raptor sat observing us silently from the top of a leafless tree. 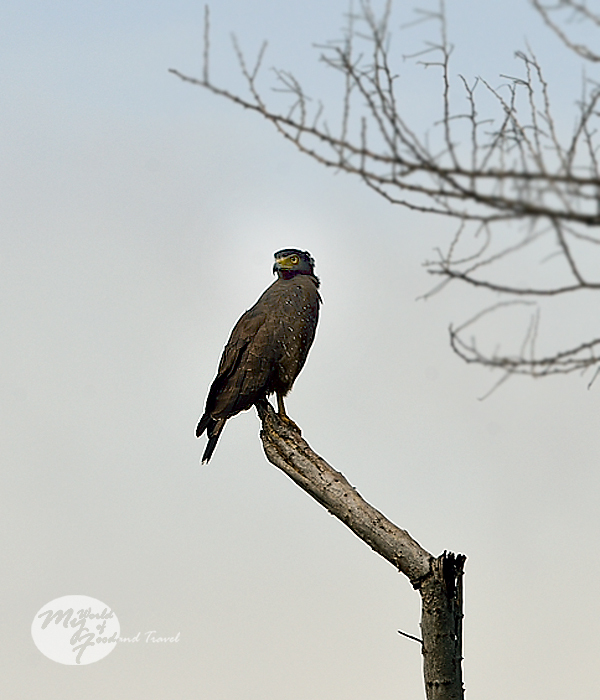 We had not expected to see a crested serpent eagle, our old friend from other jungles, so close to Bangalore. But there it was, fiercely glaring down upon us. 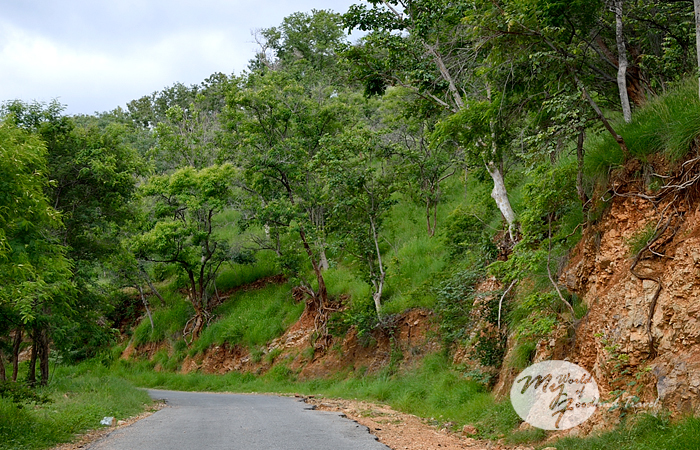 We drove on and saw quite a few white-browed bulbuls and hornbills. The morning air was filled with various bird-songs and we again played the ‘guess the bird from its call’ game. 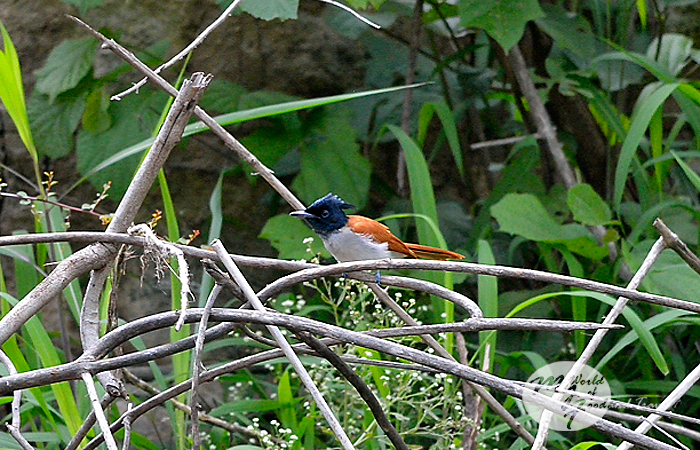 The melodious chirping of the bulbuls, the maddening cry of the common hawk cuckoo and the loud, high pitched call of the peacock rang throughout the jungle. 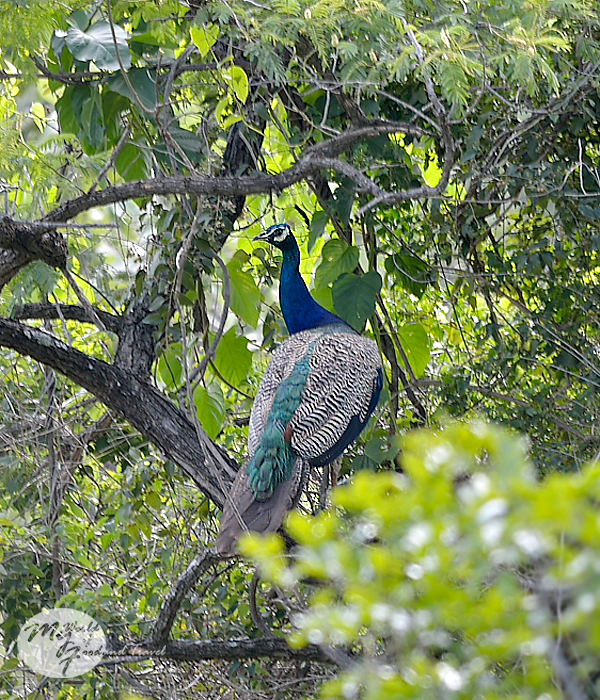 We had been hearing the peacock in many places around Bangalore but they always remained elusive. But there it was, that day, perched on a branch and in full view of us mortals. The regal creature posed patiently for us and then disappeared into the forest. It was a pleasant sight to see a thick carpet of grass replace the dry, brown patches on the forest floor. 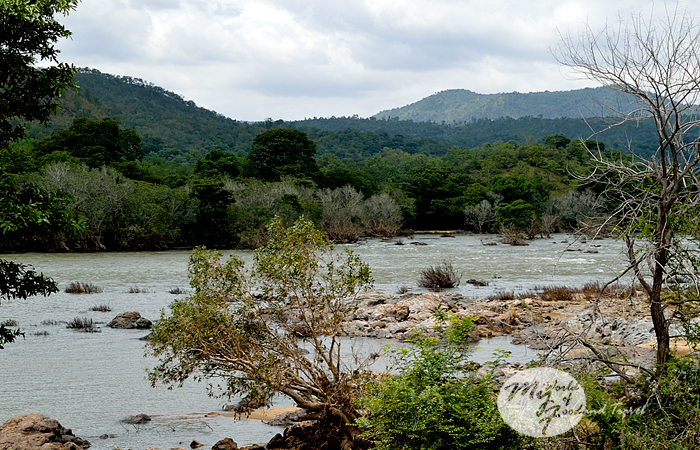 The river Cauvery had turned into a torrent with swift water currents, thanks to the heavy rains. 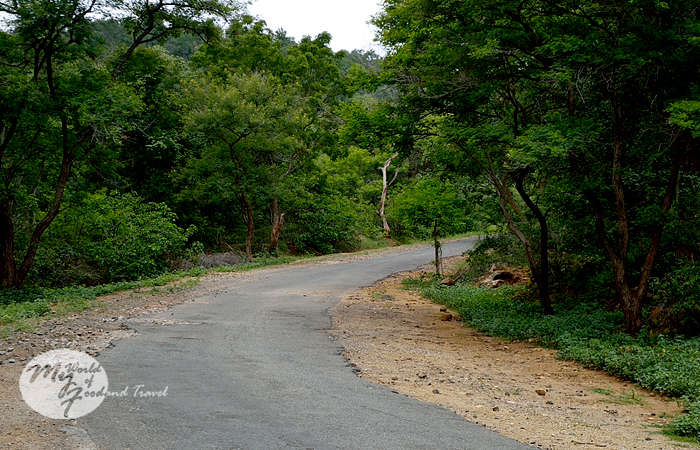 If only the trip had not been marred by the constant flow of vehicles and the thousands of monkeys… At one point of time, we almost felt like we were back in Bangalore amidst the crazy traffic. It was very frustrating to see a bird fly away just in the nick of time, startled by the sound of a fast approaching vehicle. I don’t remember such heavy traffic inside the jungle the last time we were there. I think there were some important puja being held that day in the temples inside the jungle and hence the upsurge in traffic. We saw hordes of people coming in buses with lot of food provision. Could not tell if they were temple visitors or plain picnickers. I have never hidden my dislike towards monkeys and I have enough reasons for that, although my 2 year old son has other ideas. That day, there must have been more than a thousand monkeys, sitting beside the road at many places, with little babies strapped onto their bodies. We were wondering about their presence in such large numbers when a bus passed us by and solved the mystery. People began to off-load huge amounts of fruits and other food items, ensuing a mad scramble among the monkeys. As we gaped at this sight, my eyes went towards a sign board fixed on a tree. ‘Feeding wildlife is a punishable act.’ Such precious words. Buhahaha! I should have clicked a picture of that amazing scene. But seriously, this is how the whole ecosystem of a forest is ruined. Anyways, let me stick to my birding notes before I lose my composure and go off in another direction altogether. It was a red-letter day for us, for we finally managed to see an OWL! 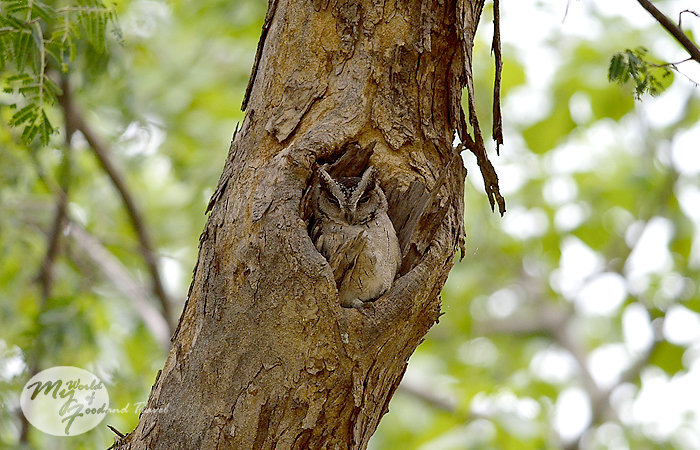 We were driven to despair looking at others’ pictures of owls – fishing ones, mottled, spotted, jungle owlets and what not. I had kind of made up my mind to ‘capture’ one somehow on this trip. And so, I would scan the large trees with ‘holes’ for any sign of them. Only problem was, we were not going very slow (*nudges the husband*). Just as we crossed an old, gnarled tree, something caught the corner of my eye. I cried at the husband to reverse and there lay our beautiful owl, in its hole in the tree, perfectly camouflaged. 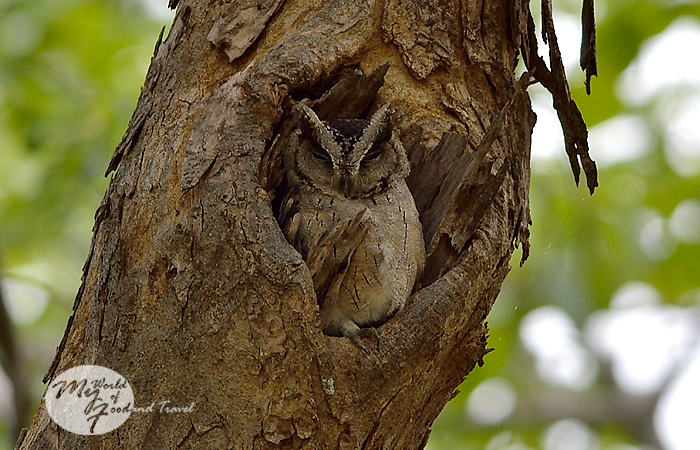 I could hardly believe my eyes when I found it to be an Indian scops owl. 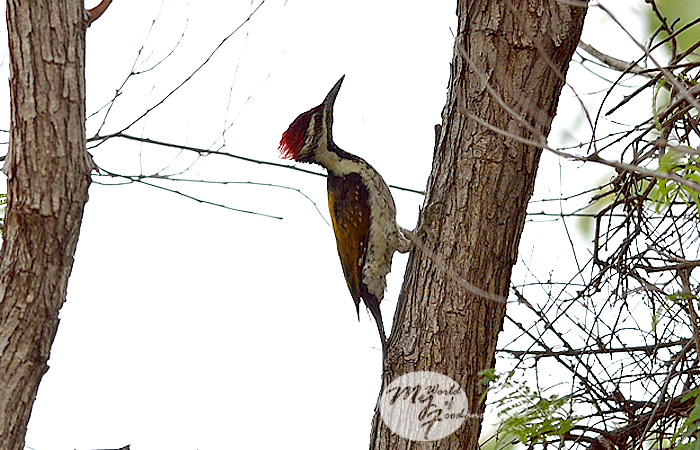 We suppressed our desire to let out a whoop and quietly clicked the sleeping bird. 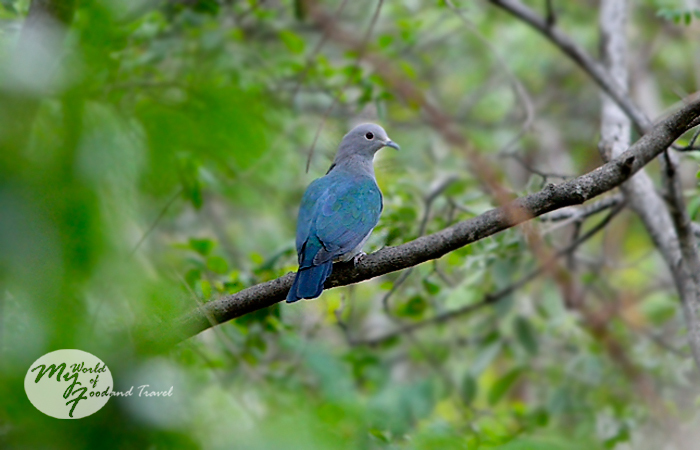 In a recent blog post, I had read about sighting of the magnificent Imperial green pigeon in the forests of Cauvery. 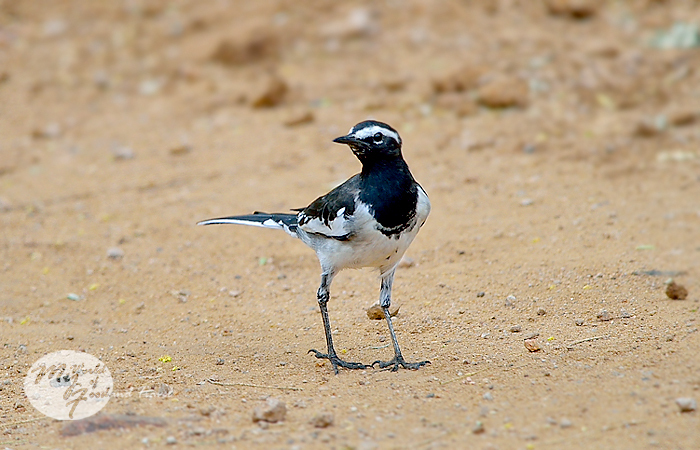 I remember this docile bird building its nest in a tree near my window when I was living in Manas Wildlife Sanctuary. 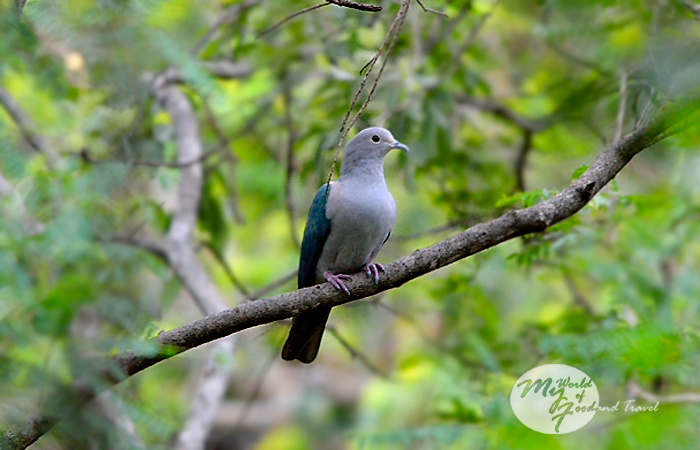 Ma and Deta had tried to inculcate the habit of us keeping a diary and every page of my diary was filled with a single scrawling “Today I saw the Imperial Green Pigeon.” Those days were over and I had not come across these beautiful birds again. 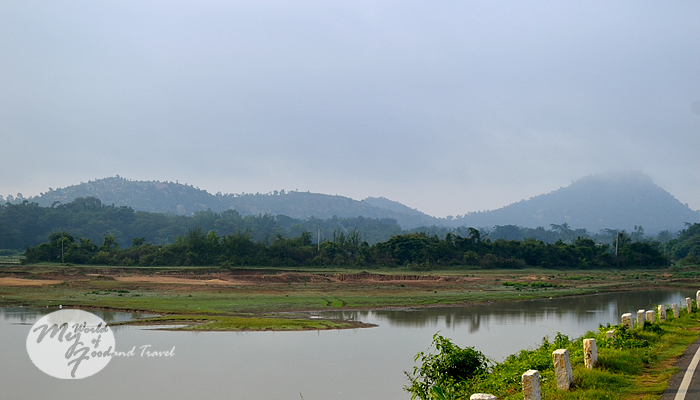 Till that day near Cauvery. We were on our way back after lunch at a secluded spot (read away from the monkeys) and were in a languid mood when suddenly a flash of bright yellow colour caught our eye. It turned out to be a black-hooded oriole which promptly flew inside a thick foliage of trees and bushes. The husband was not to give up and he got down from the car and stood at the edge of the forest, looking for his golden bird. He then waved wildly at me to come and join him. Our son had fallen asleep and I trundled along with the sleeping kid over my shoulders to see what held the husband’s attention. 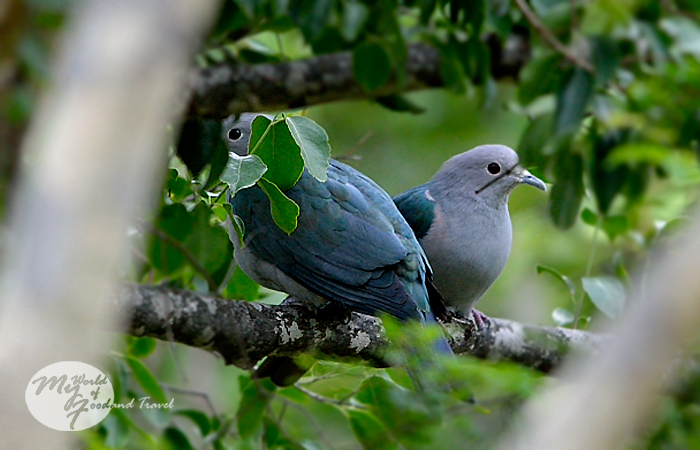 It was a lovey-dovey Imperial green pigeon pair, canoodling on a canopied tree bough. And so we met again, after so many years. 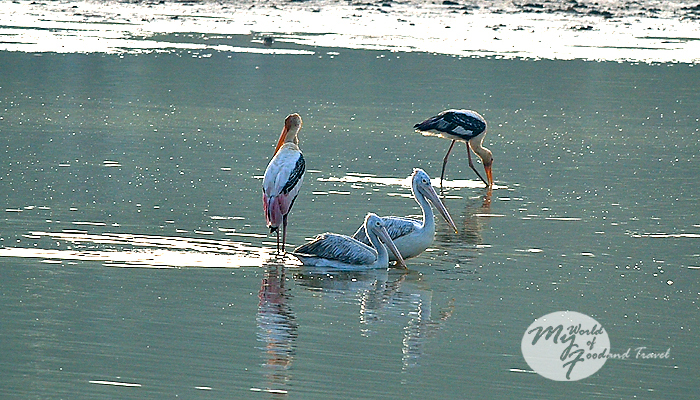 The day had turned out to be an amazing one and we enjoyed birding after the long gap. However, I regret missing out on several birds, one of them being the white-browed fantail . Our bad luck with the blue-faced malkoha continued and for the fourth time we saw the birds and could not click a picture of them. We also could not identify a number of species. I am particularly upset at not being able to identify a small group of quail type birds whom I missed while trying to figure out another bird. By the time I turned my attention to them, the little ones had scuttled away into the bushes. And no, I did not see the giant grizzled squirrel this time around also. 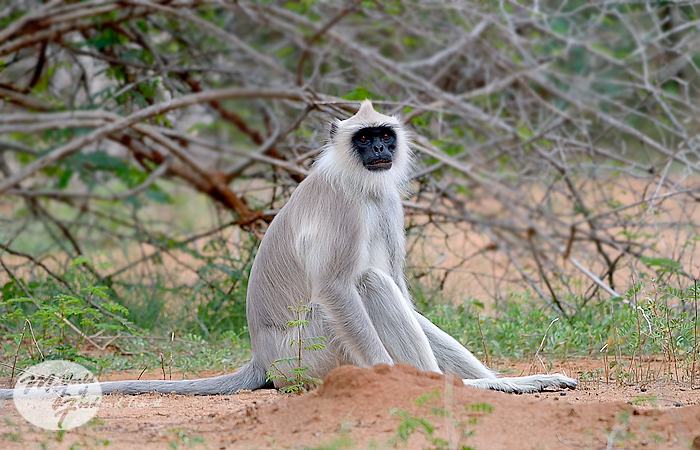 We did come across a few wary spotted deer and a family of common langurs. So, another trip again, then? Note: We went to Galibore after that but let’s make it another post. Red-vented Bulbul, Red-whiskered Bulbul, White-browed Bulbul, Pale-billed Babbler, Yellow-eyed Babbler, Indian Silverbill, White-rumped Munia, Baya Weaver, Jungle Mynah, Common Hoopoe, Red-rumped Swallow, Indian Grey Hornbill, Indian Peafowl, Grey Jungle Fowl, Asian Paradise Flycatcher, Crested Serpent Eagle, Shikra, Black-hooded Oriole, Imperial Green Pigeon, Indian Scops Owl, Blue-faced Malkoha, Purple-rumped Sunbird, Ashy Prinia, Black Kite, Brahminy Kite, Common Hawk Cuckoo, Jacobin Cuckoo, Black Shouldered Kite, Indian Roller, Black Drongo, Scaly-breasted Munia, Red Avadavat, Brahminy Starling, Asian Koel, White-breasted Kingfisher, White-browed Wagtail, Black-hooded Oriole, Plum-headed Parakeet, Rose-ringed Parakeet, Lesser Goldenback, Green Bee-eater, Indian Robin, Oriental Magpie Robin, White-browed Fantail, unidentified dark brown eagle with yellow feet and beak, unidentified quail type birds. Wow..speechless!! and you saw all this birds on a single day? Yes, we did :) Flitting glances in most cases, but still the heart's happy!! Wow I'll go sometime very soon.Same as you,I have been planning for quite awhile but never happened. Yes, Ankita, you should. It's so close to Bangalore, dont't plan any more! Thanks a ton, Harsha, hope you had a great birthday party! And, its proved your Owl spotting skills are exemplary that too from a moving vehicle... and the crowd rush would be due to the month of Sharavan. Pointers, pointers...let me think...I think you should spend more time in the stretch from the jungle check post to the point where the road starts climbing the hills. We got most of our birds there. And once you take the left turn from the main road, keep a look-out on the right for the small pool of water where the baya weavers colony is located. 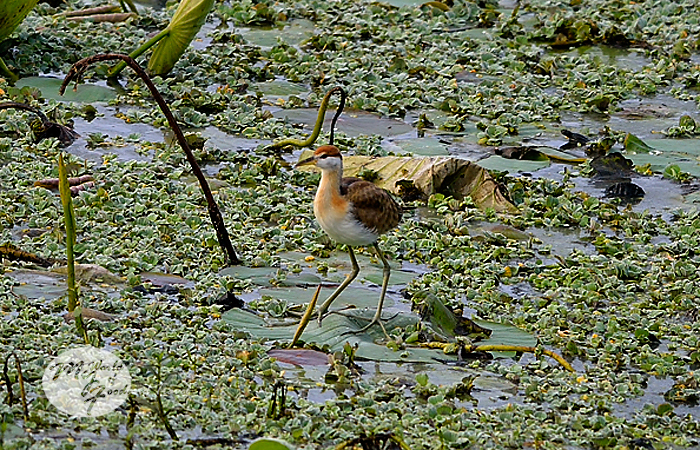 We saw a lot of small birds there. Can't think of any landmark for the 'raptor point' though... When are you planning to go there? hopefully this weekend, you could mail me if anything comes to your mind, thanks! What! You saw the grizzled squirrel!! Now I am super jealous. Please share the pics, at least on your FB profile. 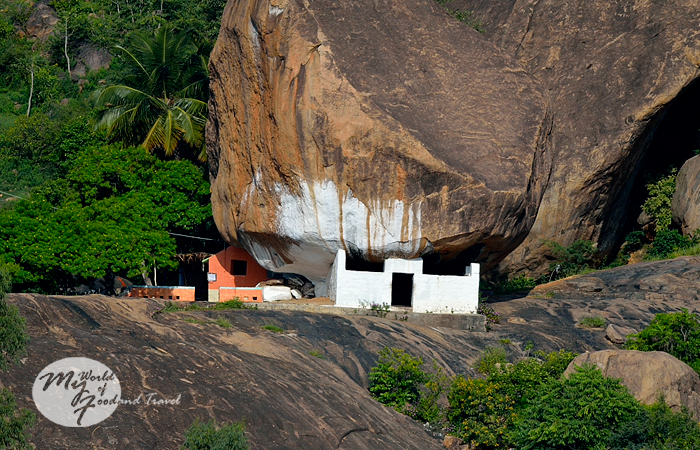 BTW, we are thinking of going to BRT Hills in Oct, will ask you for info then. 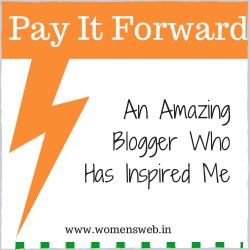 Thanks, Aditi! We had gone out after so long na, maybe that's why the birds decided to make us happy that day!